I am confused about this history of the caboose recently scrapped at the Grafton & Upton. That is not the same caboose in the first photo, unless the trucks were changed, the cupola relocated and a fourth window added (#35 was a 3 window hack). It appears to me the G&U had two ex RRRR cars. The Rut #35 and one of the DL&W hacks. Anyone know if this is true? And if so, what happened to #35? picture of the hack track at SA and #7 is there behind #6.
at least in the cupola area. Yup... looks like numbers 6 and 7, respectively. For your convenience, I have attached the official caboose roster. Source: Rails Up The Raritan. I agree that Rutland #35/Raritan River second #7 look to be green car on the Grafton & Upton. However, the roster shows #7 sold by CR in 1980 and the G&U picture shows the car on the G&U in 1972. Something ain't right, unless the car was leased. If this is the same car as the G&U car, apparently it is an ice cream stand in Bass River, MA. So, add another RRRR caboose to the survivors list. I am working to confirm this. Now for the car that was scrapped. Yes, the car body matches #6 but the cupola location and style does not. Take a good look at the burned out picture. The cupola is steel and slightly off-center. The shot of #6 shows it to be wood and centered. It could by the G&U altered it. It really cannot be any other car, as the fate of the other ex DL&W hacks is known. So, I will tick off #6 as a survivor until May 10, 2008. I see them as the same... could be the picture angle working against us. Alternately, it could have been number 8... another ex-Lackawanna of same design as 6.
was burned, the newer steel one was scrapped after its little jaunt. Great discussion, thanks for all the feedback. If I remember right, this would almost have to be #6 as #8 is in Ivyland, PA. Still working on confirming if #7 2nd is the G&U car. Just got confirmation on both cars. It was #6 that was scrapped, and it is second #7 that is at the ice cream parlor on Cape Cod. Scrap that confirmation of second #7. This is a real mystery. 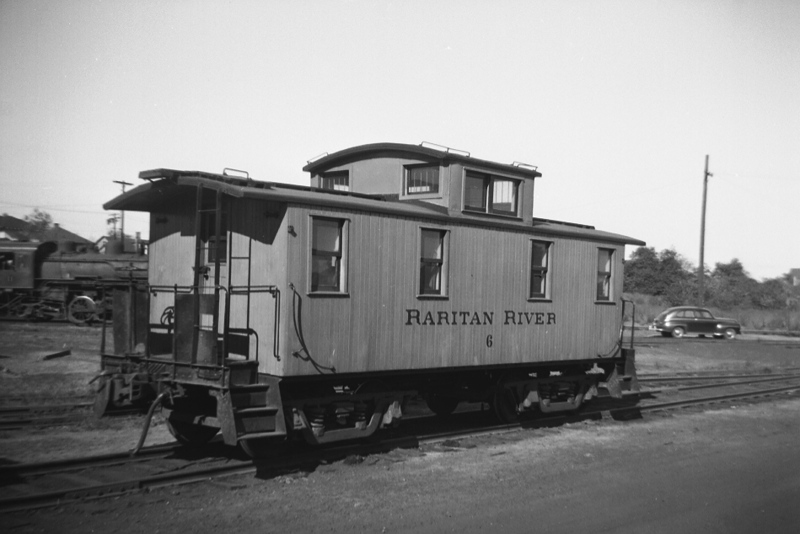 We know that Rutland #35 was a three window caboose built in 1924 to a NYC design. It was never a NYC car, however, it was always RUT #35. 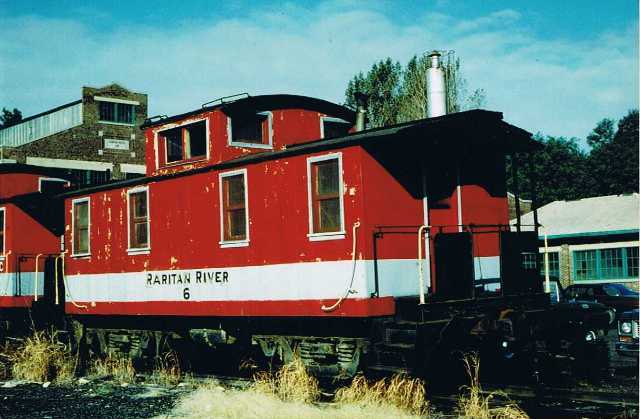 It went to the Vermont Railway in the early 1960's and then was part of a three-way deal that saw original Raritan River caboose #7 go to Allaire State Park, NJ while Rutland #35 became Raritan River #7 the second. Photos online show #7 in Raritan River red in New Jersey as late as 1976. Published rosters show it being sold in 1980 and online accounts have it and #6 going to the Grafton & Upton around 1980. And that is where things get fishy. The G&U had a three-window, NYC design car just like #35 but photos online show it on the G&U in 1971. Since #35 was still in New Jersey, they cannot be same car - if the dates are correct. 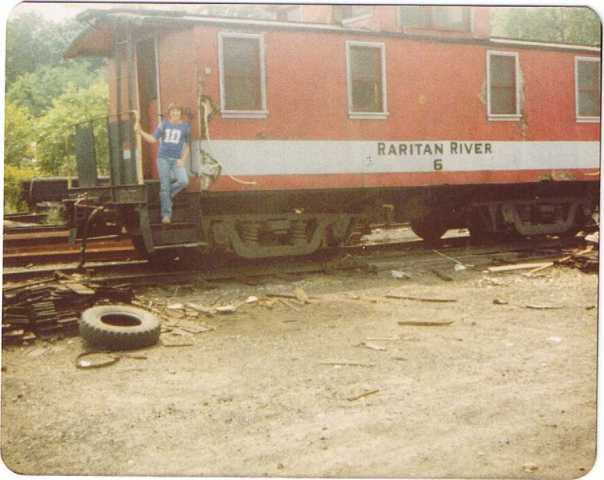 Apparently, a NYC style caboose on the G&U had the body stripped off its underframe in the early 1970's. The underframe and trucks languished at the G&U. Contradictory stories say this car burned, or that it was made into the ice cream stand in South Yarmouth, MA. 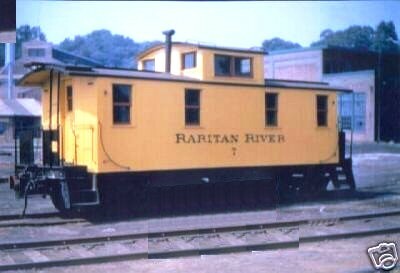 Now, throw in the fact that the caboose scrapped over the weekend does not match the exact profile of either Raritan River #6 or RUT #35. The body matches #6, but the cupola is off-center which would mean it was moved. The cupola is in the right place for #35, but that would mean it had an extra window (as the car as four windows) and a new cupola added since it is steel and high, while #35's was low and wood. I am beginning to think there is a third caboose in this saga. WOW! What a sad sight! Oh thats hurts...but at least we can put her to rest now that she has been found. 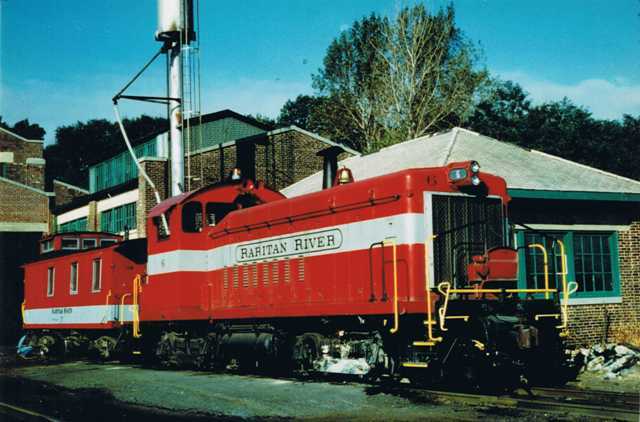 RRRR Caboose No.5 Ex-Lackawanna went off the South River Draw in 1968. Reportedly it was scrapped on site, probably burned after it dried out. 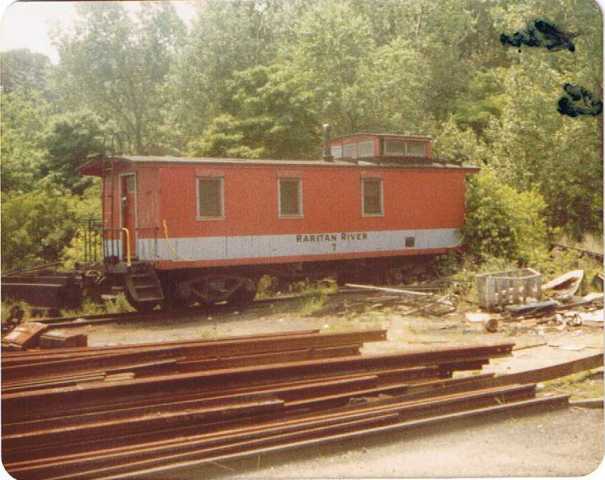 RRRR Caboose No.6 Ex-Lackawanna was sold by Conrail in 1980. RRRR Cabosse No.7 (1st) Ex-Lackawanna was sent to Alaire State Park for the Pine Creek Railroad, and still survives today painted in yellow as the office. 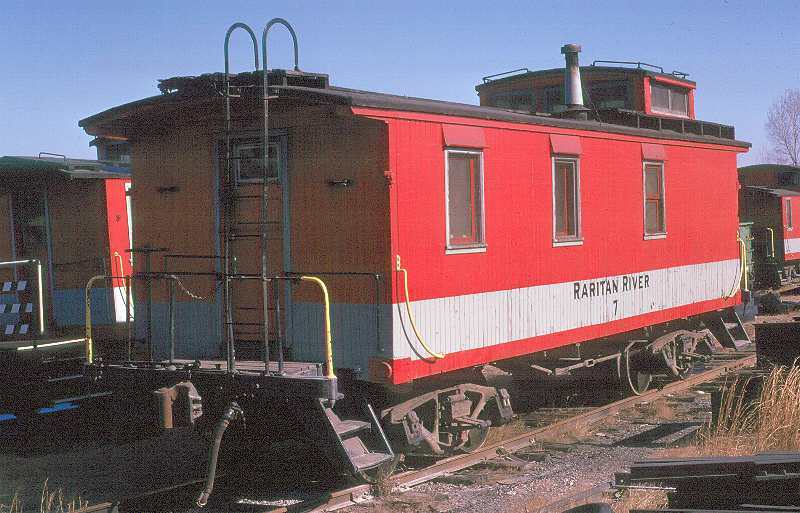 RRRR Caboose No.7 (2nd) Ex-Vermont Railway Ex-Rutland Sold by Conrail in 1980. This caboose only had 3 windows on each side, and the cupola was off-centered. 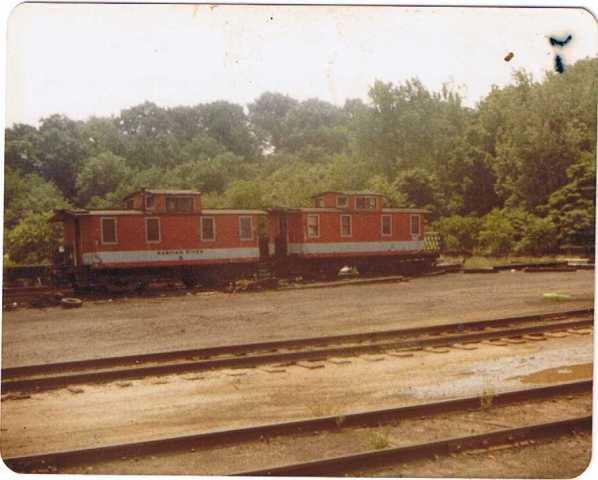 RRRR Caboose No.8 Ex-Lackawanna was sold by Conrail in 1980. Showed up in IvyLand, Pennsylvania. This is the famous caboose with the observation deck put on the back after an accident damaged the coupler. That deck in the back is what proves that the hack in Ivyland is No.8. Sometime in the last 28 years, someone added a 3rd window in the upper cupola. 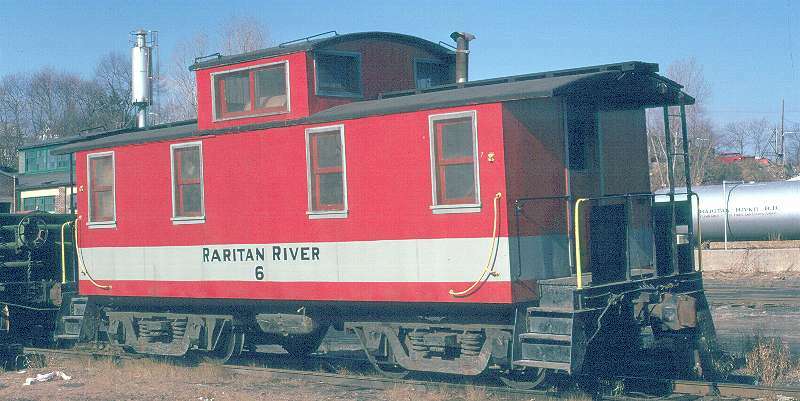 That would imply that the scrapped caboose on the Grafton & Upton was old RRRR Number 6. From the angle of the picture, it looks like the cupola is off center slightly, but the windows match, the trucks match, the name is clear. Maybe the cupola was badly damaged or moved in the fire? you can clearly see the yellow painted wooden slatted portions under the flat boarded sides. Here is a great shot from 1966 which shows No.6 in front of No.7, both painted yellow. It also highlights that fact that when No.6 was rehabilitated with the boards covering her yellow wooden slatted sides, the flat boards were also originally painted yellow. As far as RRRR Caboose No.7....who knows? 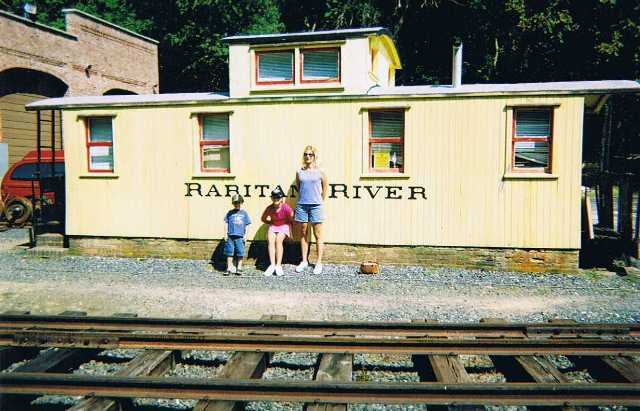 It was on the Raritan River until the end in 1980. Now all we need to do is track down that missing engine and good old Caboose No.7! One of these days I'll have to put an updated caboose page on my site with all this great info! Of all the photos in all the world ,you had to walk in and use mine!!! Still plays with trains,but gets paid for it! !